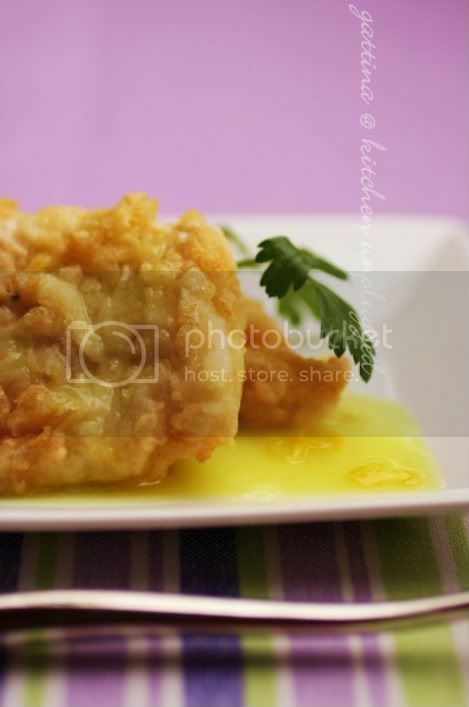 Of such dish the fish fillet is normally dipped with egg-flour mixture and deep-fried first. Since I intend to eat it on the next day and consider the crust turning soft, the fillet (lightly floured) is simply pan-fried. Honestly, it tastes superb. Also, I used some flour to thicken the sauce so that the consistency is able to last longer. Please do the sauce (as follow) before cooking the fish. Bring a pot of water, sugar, lemon rind to boil, then add about 30 ml of lemon juice, lower to simmer. And a pinch of chicken powder, a tiny pinch of tumeric and the flour mixture into the sauce, taste and adjust the sweet/sour taste, simmer for 15 minutes. 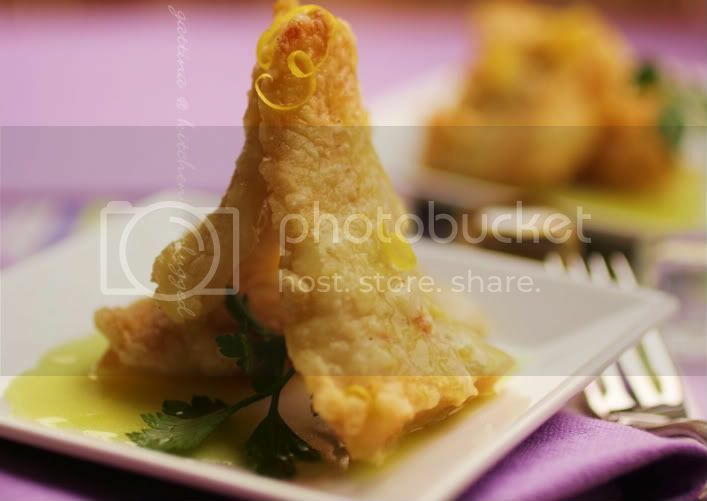 Discard the lemon rind and ginger, keep the sauce simmering, add the conrstarch water until your desired consistency. Turn off the heat, stir in margirine until it's totally dissolved. Spoon some flour in a wide-base bowl, add a pinch of salt. Set aside. Sprinkle a bit of salt over the fillets, roll them over the flour mixture. Pan-fry them over medium heat until they're done. If consume the dish next day, store the fish and sauce seperately. After re-heating both, pour the sauce over the fish right before serving. I thought they always do this with chicken rather than fish no? Anyway, interesting presentation and great minds think alike because i just made Sticky Lemon Chicken by Gordon Ramsey! The use of lemon...Mmmmmmm, love the aroma! Gattina each one of these photos is so perfect, so gorgeous that crust is and I'm a fool for crunch. Mmmm! I'd love to have some of this right now. WOW! Looks and sounds so good! Think I will ask my mum to make this next time I'm there for dinner! Sluuuurp! I really love the photos of this! Makes it look so warm and comforting. please tell me what is chicken powder? Jonathan, Chicken Powder is chicken stock in a fine powdered form. Knorr ia a brand that makes this, it caomes in a small tin can and the powder is a pale beige colour. It is finer than a crumbled chicken stock cube and easily added to enhance flavour to foods. I buy mine from chinese supermarket.